SkyDrive is live with OneNote Sync, you can now go to Office.live.com and start upload your OneNote files. Office Web Apps on SkyDrive are available free for personal use. 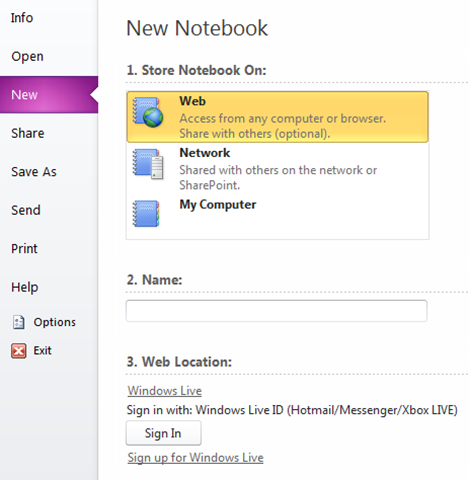 When you creating New Notebook in OneNote 2010, you can now save it to SkyDrive directly. To get start, you will need to have a Windows Live ID, and sign in when you are asked to. Notebooks will be automatically synced among different OneNote clients if they are online. This is because you are using a pre-release version (either BETA or RC). OneNote Sync with SkyDrive only works with OneNote 2010 RTM edition. Upgrade to OneNote 2010 and you should no longer see this message. Open IE, go to IE Internet Options, clear browse history, passwords, cookies. And then retry. Update 4/25/2012 SkyDrive Release Windows Client now you can drag and drop files directly to your SkyDrive folder in Windows Explorer and view it anywhere on any device!